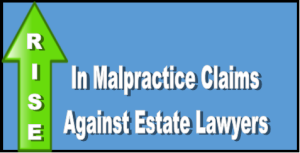 Malpractice claims against trust and estate lawyers across the nation have risen steadily over the past 25 years, and observers are predicting that trend will continue. The news is brighter here in North Carolina, where trusts and estate claims are somewhat lower. Overall, the practice area that encompasses wills, trusts, estate planning and probate law accounts for 10.7 percent of all claims nationally, according to the most recent statistics from the American Bar Association Standing Committee on Lawyers’ Professional Liability. That makes it the fourth-riskiest practice niche, behind real estate, litigation and family law. Those numbers are expected to grow – at least on the national level – as states such as New York chip away at the privity requirement that historically barred many probate claims. In North Carolina, trusts and estates also rank fourth in claims frequency (tied with bankruptcy law), based on Lawyers Mutual’s 2014 claims data. But the eight percent slice of the pie is proportionally smaller than the national figure. Notably, trust and estate claims have risen steadily since 1985, the year the ABA Standing Committee conducted its very first study. Back then, estate claims accounted for less than seven percent of all claims. That number rose to 7.6 percent in 1995 and 8.7 percent in 1999. The 10.7 number in 2011 represents a high-water mark. That’s a 50 percent rise in estate claims nationally over the last 25 years. Two decades of court rulings have raised the probate practice risk for New York lawyers. Do you prepare wills or do estate planning? What are some of the risks you encounter? Do you think those risks are increasing?